An Elder is a person who is still growing, still a learner, still with potential and whose life continues to have within it promise for, and connection to the future. An Elder is still in pursuit of happiness, joy and pleasure, and her or his birthright to these remains intact. 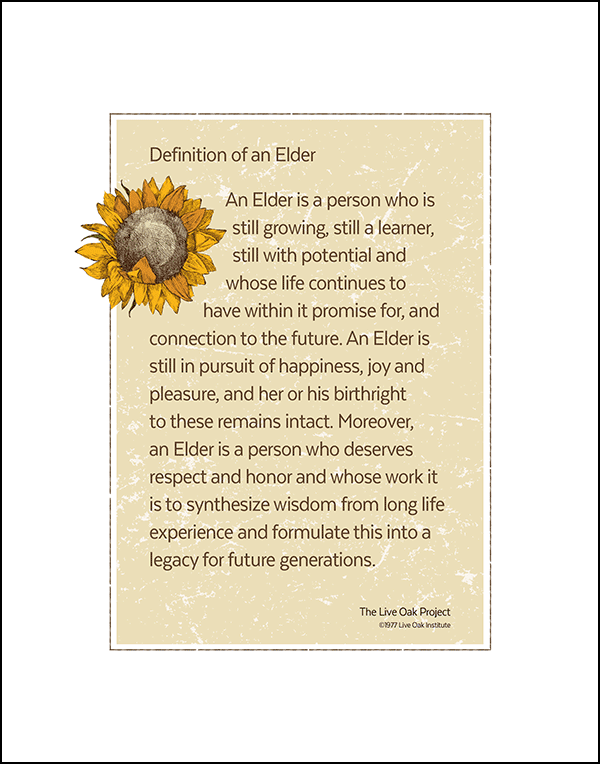 Moreover, an Elder is a person who deserves respect and honor and whose work it is to synthesize wisdom from long life experience and formulate this into a legacy for future generations. The Story of the Live Oak Definition of an Elder Every social revolution has begun with consciousness-raising to replace the internalized negative self-image of the people who urgently need liberation with a positive and empowering way of seeing themselves and one another. This was true for Moses when he led the Israelites to freedom, for Dr. Martin Luther King, Mahatma Gandhi, President Nelson Mandela and the mothers of the Women’s Movement. When Barry Barkan saw his grandmother just before she died in a typical 1960’s nursing home, it was painfully clear that people in nursing homes had fewer civil rights than virtually anyone he had encountered in his work as a civil rights reporter in the Southern United States. Ageism and marginalization of old people rampant in society was exacerbated by institutionalization, making it acceptable practice for people who lived in homes to be tied-down, drugged, dispirited, hopeless and diminished in their sense of self. When Barry and his partner Bob Berke launched the first Live Oak Project at the Home for Jewish Parents in Oakland in 1977, it was high on their agenda to challenge the imbedded negative stereotypes of aging. To do this in those days before Kinkos, they had the Live Oak Definition of an Elder hand painted on a sign as a gift to the home’s elders. 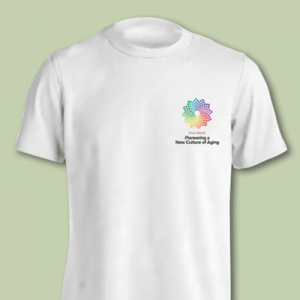 The residents, who described themselves at the outset in language that reflected loss of role and purpose soon took on the role of elder, regenerating individual and shared self respect and challenging the status quo in the home and the wider aging community. 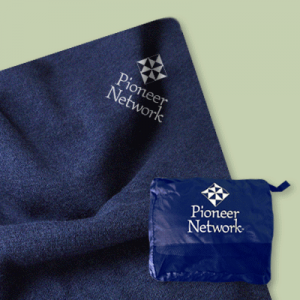 A year later, George Lithograph Company donated 1,000 Live Oak Definition of an Elder posters and Live Oak’s founders hawked them at the national conference of the Western Gerontological Society, the precursor of the American Society on Aging. The goal was to change the operant language in the field from “senior” to “elder.” Within a year, the word “elder” entered common usage in the professional community. In the early 1990s, when Reb Zalman Schachter Shalomi launched the Spiritual Eldering Project and wrote the book From Age-ing to Sage-ing, he was given permission to retitle the Definition of an Elder as the Elders Creed and it became a foundational concept of his eldering philosophy as it has been promoted throughout the conscious aging movement. When Dr. Bill Thomas, founder of the Greenhouse Project, wrote the book, What Are Old People For? 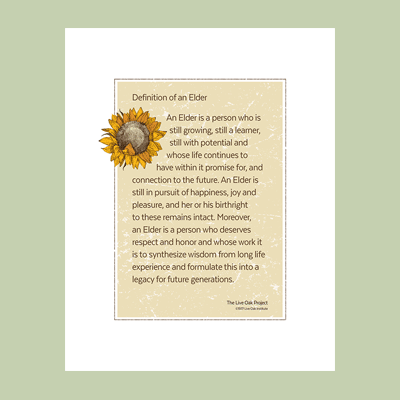 How Elders Will Save the World, in 2004, he compared the Live Oak Definition of An Elder to Alfred Tennyson’s Ulysses as major contributions that span the centuries to prepare the way for a “historic change” in the way old age is viewed and experienced. 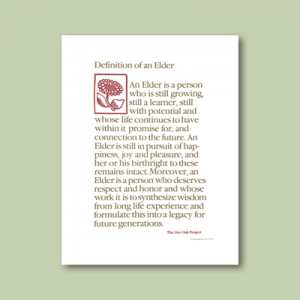 Today there are tens of thousands of copies of the Definition of An Elder in circulation, sold as posters by Live Oak Institute or reprinted with permission by organizations throughout North America and Israel.